When things don’t work out, don’t stress about it, it is the right time to sit back and breathe the agony out. Sometimes it happens when we are under pressure, our mind stops working, it just halts in the midway. So the best way to overcome this mind block is to step back, pause and take a break to relax. It is the good way and kind of a remedy which works. We all need to train our minds to take a cessation and get back to the state of being normal. We all go through the encumbrance of work and the load does not diminish on the nerves but instead it escalates like anything. Nobody has the superpowers of ‘Flash’ to outdo oneself, we all break down and some day we don’t even feel like working because of eye strain of massive work pressure. What I being a graphic designer do, I give my mind an hour of peace before getting started again. It helps to collect all the segregated and clogged portions of thoughts in mind. This essential break is much needed for all designers and artists’ who have to compose something creative. Inventiveness comes rarely to a dull and tired mind, so better peace out and back down the sudden insecurities. Haste often and mostly makes waste, and nobody wants to come back defeated from the marathon. 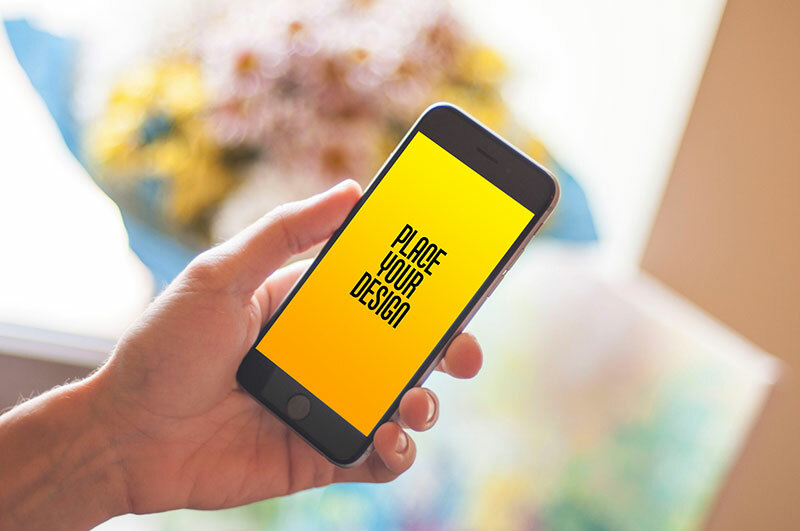 Well coming towards my today’s post which is highlighting free mobile in hand smartphone photo mockup, basically I made this free mockup for all those who have to display a poster, snap/picture, typography or an image—to the client. Simply insert in your design elements into this mockup of smartphone to manifest how the image will look like in the real form. This will give your client a fair idea and he will totally approve your efforts. For more amazing design collection, stay tuned because we have tons of things to surprise your design cravings of every day. Here we go! 2. Layers are hidden to decrease the size of file kindly unhide, ungroup and place your design on colored layers. Background is attached in the zip file kindly place it as well.